We had a lovely activity to do as part of Sunday’s morning down at the base … a visit up to see friends of the Pett Level Independent Rescue Boat, Graeme and Leonie Gambrell of Fairlight Stores. Graeme and Leonie always give pride of place at the front of the shop counter to a large donation bottle on behalf of the PLIRB, and the recent emptying of the bottle resulted in the biggest donation total every received from this particular bottle. So it was with high spirits and much appreciation that we popped up to say hello and to present a certificate of thanks to Graeme and Leonie, pictured above with David Martin, Chairman; Sarah Harris, Tornado Helm and John Brooker, Trustee and Base Crew. 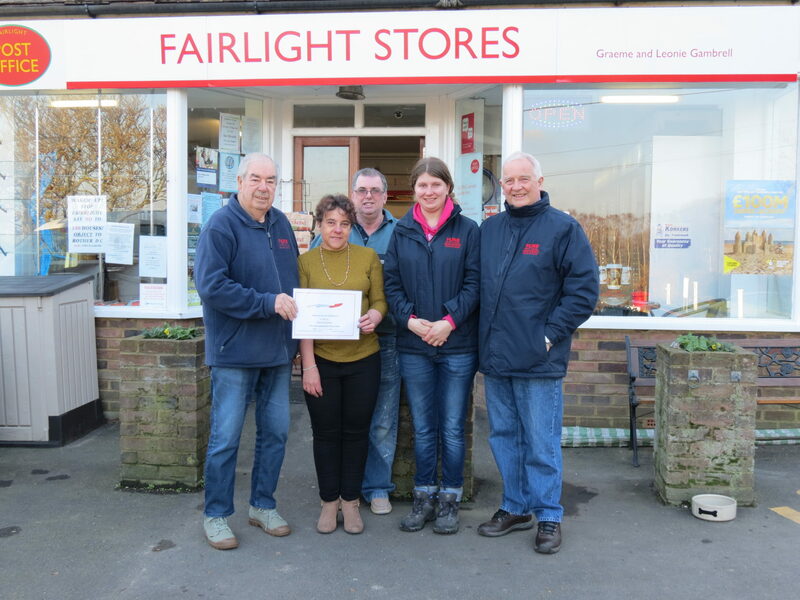 And of course, although it’s Graeme and Leonie who give us the spot on the counter, look after the bottle and help us to raise much-needed funds, it’s members of the Fairlight community who are customers of the Fairlight Stores who do much of the donating. From the small change after making a purchase to popping a bit of extra cash as a donation into the bottle, the total this time around really does show that everything which goes into the bottle really adds up, so here at the PLIRB we’d like to say we’re extremely grateful to the Fairlight community for supporting us, especially those who have made donations to the bottle and who support Fairlight Stores in their support of us.